So I dug out a "proper" power supply from my collection....proper as it will give full control over voltage and current unlike a battery charger. Apparently control over current is more important than voltage and we don't want too much of either. 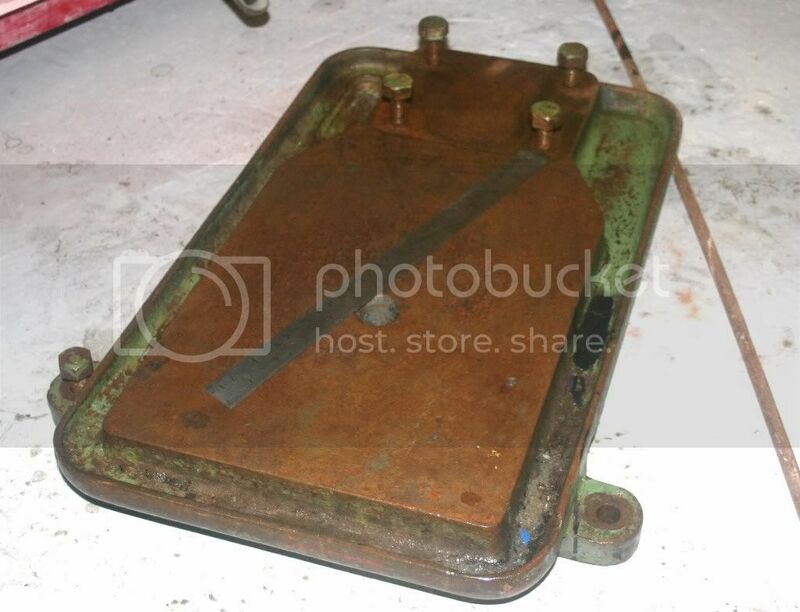 The subject to be de-rusted is connected to the negative making it the cathode. It's hard to tell from the pic, but this is down to the bare cast iron with very little rust left. Mostly what was hiding under the paint that was still attached. Well done, are you going to paint it again or protect it some other way? And a quick sand blast and it would look like new. This is much less aggressive and safer to your skin etc, the mixture can even be thrown on the garden when you are done as some plants will benefit from the iron content. 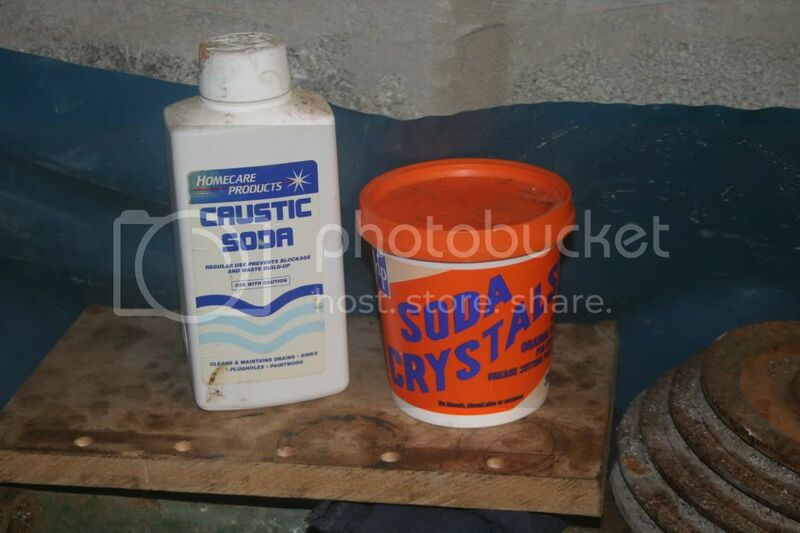 A caustic soda mix would really need to be disposed of carefully. Now that I have seen that the mild solution strips paint off I'll probably not try the caustic soda as I really see no need. For smaller parts and a little less exotic setup, you could try this. No thanks.....far too expensive...I've been down that route many times in the past. There is nothing exotic about what I'm doing. 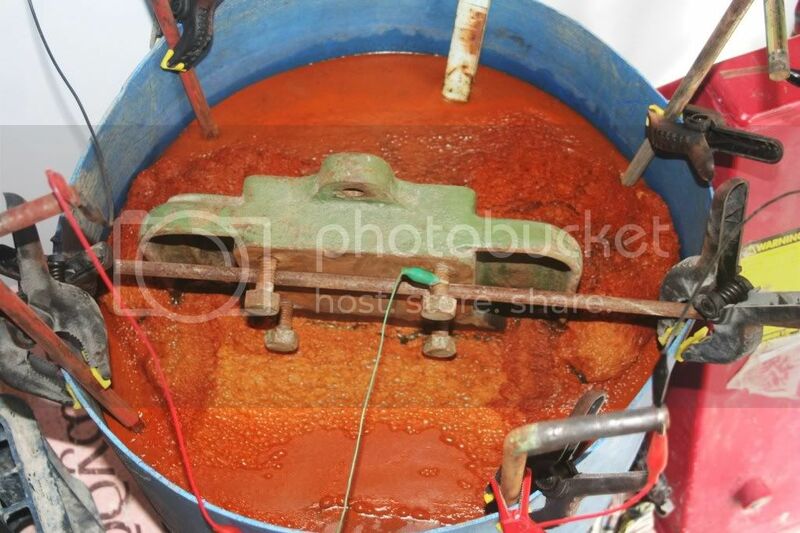 It's just a bucket, some scrap metal, water and about 20 pence worth of washing soda that will last a very long time. OK I'm using a fancy power supply, but an old phone charger would work equally as well. That £12 tub wouldn't be enough to clean my one part, never mind the rest of it. You'd be better off with a 26p jar of vinegar, it'll do the same job. Or a gallon of brick cleaner from your building merchant, mix with wallpaper paste and you're away. Of course all this only works if you can submerge the part. Good for getting ally pinning out of files. 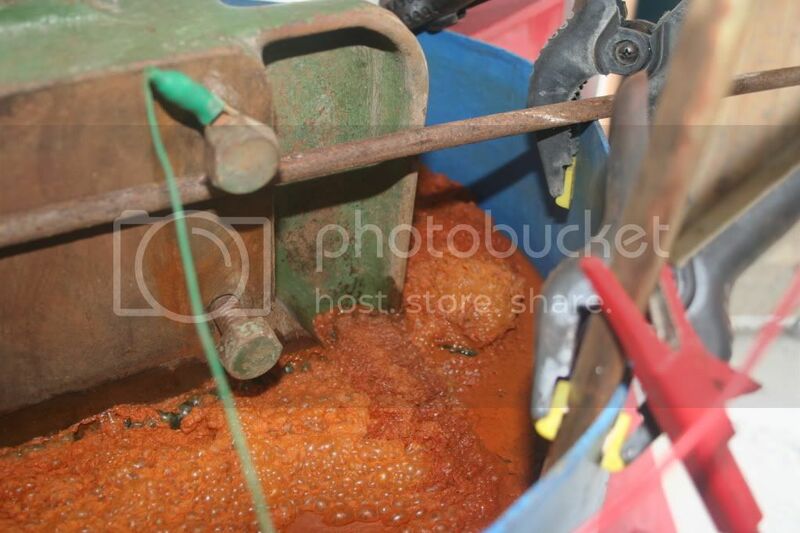 You can use it with non-submerged parts, use a flannel 'poultice', tape the anode to it. Keep it wet. Works well, dump the bit in, leave it to it. Nice one never thought of trying that. Thought those electrolytic cleaners were something special. For general metal cleaning you can boil metals with washing soda. I have a couple of psu's i used for my anodising, one dual output very similar to yours the other a Maplin 0-30V analogue jobby as backup. 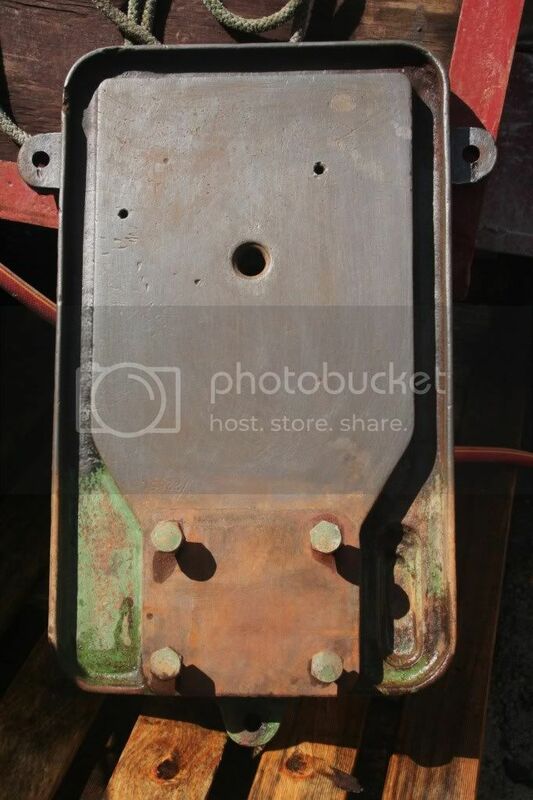 You say this removes the rust to base level, therefore if say thin walled tube with pitt marks would it eventually remove in the holes without eroding what you want to keep? Dave that reminds me, I used to use Caustic Soda mixed with water and wallpaper paste to strip paint of woodwork, doors and such. Make the goey mixture up, cover the door etc and then cover with wet towels and such. Caustic works 100 times better if it's warm. So if you can put the doors outside on a sunny day the results will be amaizing. You have to keep it wet though by sprinkling with a hose now and again. Glad to hear this de-rusting lark can be done in a similar fashion. 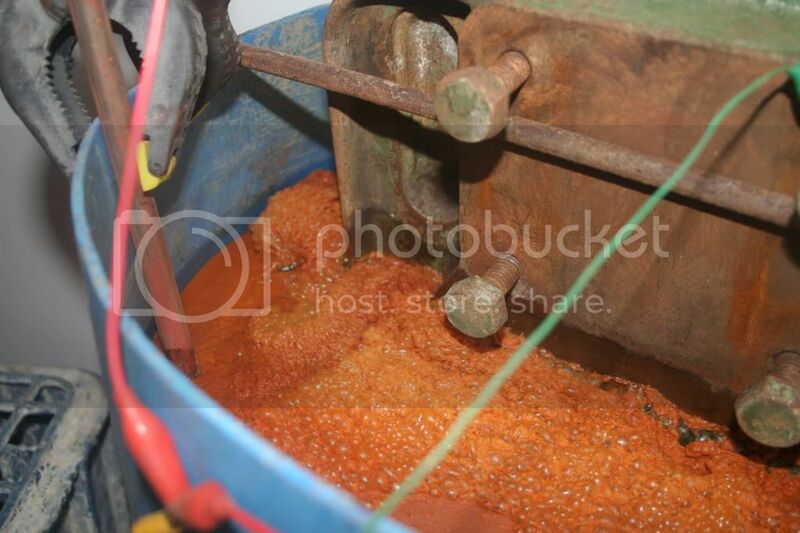 It should only remove the rust and not touch the base metal. Only try this with steel or iron or you may have a little irreversible disaster on your hands. Johnny, as far as I know, it is non-aggressive. I have certainly left stuff in for several days, all it does is gets the rust off. It does get into pits, and cleans 'em out. I usually scrub the bit off with detergent, dry it, then slap some 'Bondaprimer' on it. Some steel I did several years ago is still rust free. I was first shown this method about 40 yrs. ago by a guy who was a 'conservator', used to tart up stuff for museums. The first occasions I did it was with a Davenset Charger, mit selenium rectifier thingy. I suppose I could stick one together, and meter it. Or just assume the geezer knew why even if I don't .. Being a cheapskate I've tried ordinary garage floor paint on metalwork with some surprisingly good results. Even painted onto firm rust it seems to hold fast for many years. It is a bit far back in the post now, and I wasn't trying to detract from your post, far from it. But for people that don't have the facilities you have, mine was an easy, although expensive second option, and they should also be given the chance to be considered, rather than just being thrown to one side, with very derogatory comments, as though everyone should go out and equip themselves to do it your way. As I said, we don't all have the bits and bobs plus space to do it like you do. It might seem normal to you to have barrels and power supplies laying about, but to a lot of us, it isn't. But sometimes, we need to get rid of rust as well. Because of that, what I suggested is the way I would go, if I had rust to get rid of. John, Sorry if I sounded dismissive, it wasn't meant to be offensive, but rather hopefully informative. Smaller parts should take less time so it might be done in an hour. But rather than spend £12, a 26p jar of vinegar would achieve exactly the same result and come with it's own jar. I also gave some other options. I have over the years had the need to de-rust many parts, and as such tried most methods inc an awful lot of propriety products. I have even imported them from the US at great cost. Of them all just one product shone above all the rest, (in fact the rest gave pretty mediocre results in my opinion) a product called "Metal Ready" from the US but don't expect it to be cheap as it comes in gallons. They all share one thing in common, they contain acids of some description that does the work. The rest of the goo is just a carrier. The truth is vinegar or builders cement mixer cleaner are not only cheap but is also just about as effective. cement cleaner esp so. Heck it the same acid as the propriety products use and normally at a 16% concentration so it's stronger. 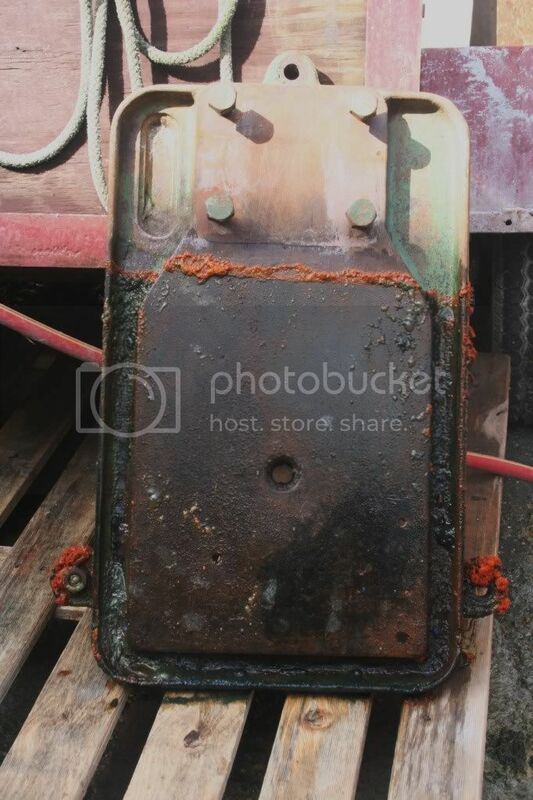 I have never tried electrolysis to remove rust before, but I have to say it beats all of the other products hands down. There is no question about that in my mind now that I have tried it for myself. 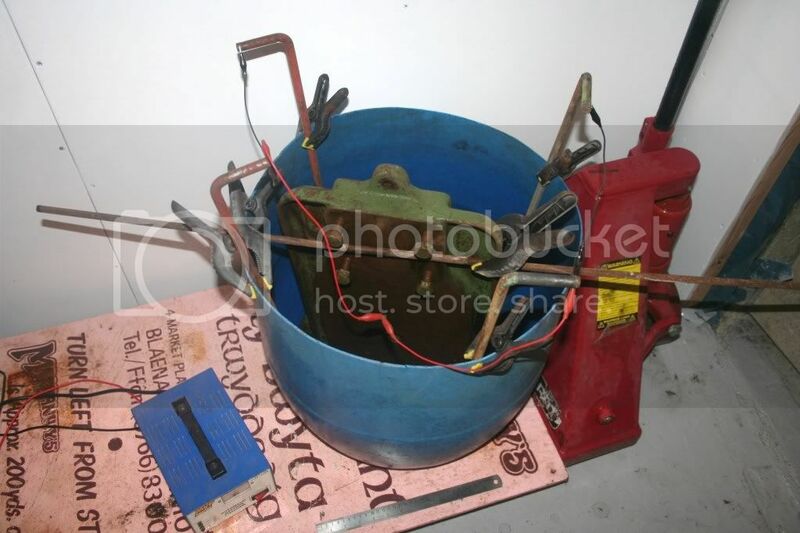 If someone can't rig together a small vat with the necessary parts then they really are not trying very hard are they? Washing up bowl, water, washing powder, cleaning agent or even salt, (even just plain water will work, it'll just take longer), a piece of scrap metal, small power source being a car charger, phone charger or even a battery even if it's out of your car. It's so simple I cannot imagine anyone here does not have this stuff to hand or can't pop to the store tomorrow to fill the missing pieces of the jigsaw. Most people can set this up without spending a penny, like I did....it's not hard. In order to keep from drying out you can wrap with clear plastic to keep the air from drying it out. Then you can lay it in the sun to keep warm until such time as it has striped the paint. This saves the wet rags and sprinkling which tends to dilute the solution and slows it down. 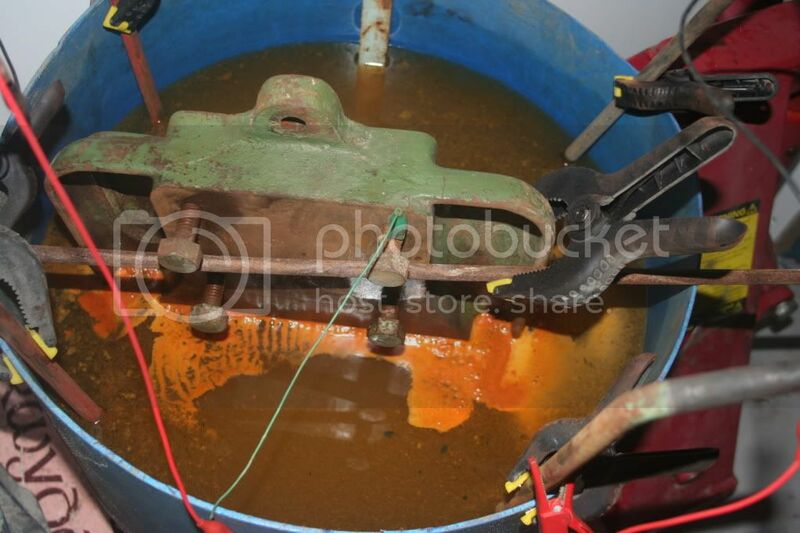 I've used the electrolytic process as well as a number of the goops. We did a test with members of the metalworking group-- I took some 12L14 bar, noted for it's rusting ability, turned a very fine thread on it (to check on material removal and catch people jigging the test), degreased it and left it outside for a month. Chopped it into sections and handed them out to be de-rusted by the members' favorite goops. 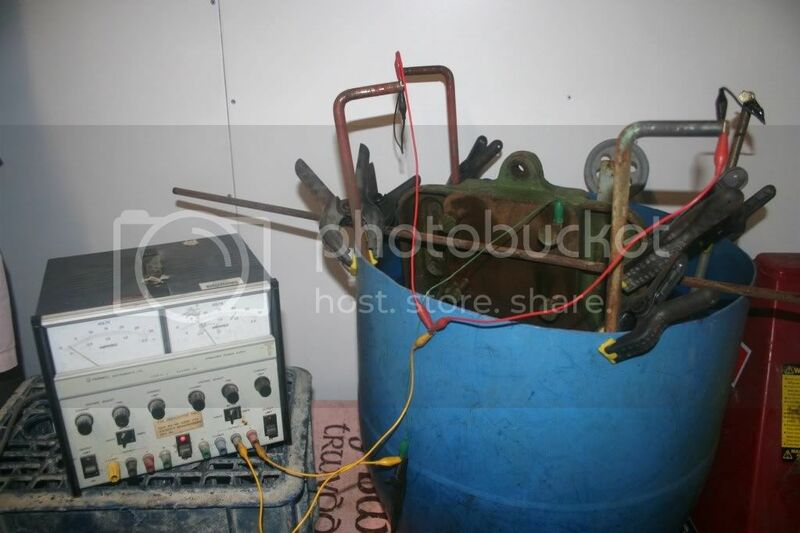 Of all them, Electrolytic came in a close second, the winner being Evap-o-rust-- a non-acid solution available around here for ~$20/gal, and re-useable many times over. In addition to being slightly better on rust removal, it also sidesteps the hydrogen embrittlement that rumor has it can go with the electrolytic method if used on tools and the like. Anyway, either far beats the rest of the competition. I looked up Evap-O-Rust and although they don't give much away it sounds suspiciously similar to Metal Ready, could be the same thing? With Metal Ready I found it ate surface rust in a flash, was really quite amazing to watch. 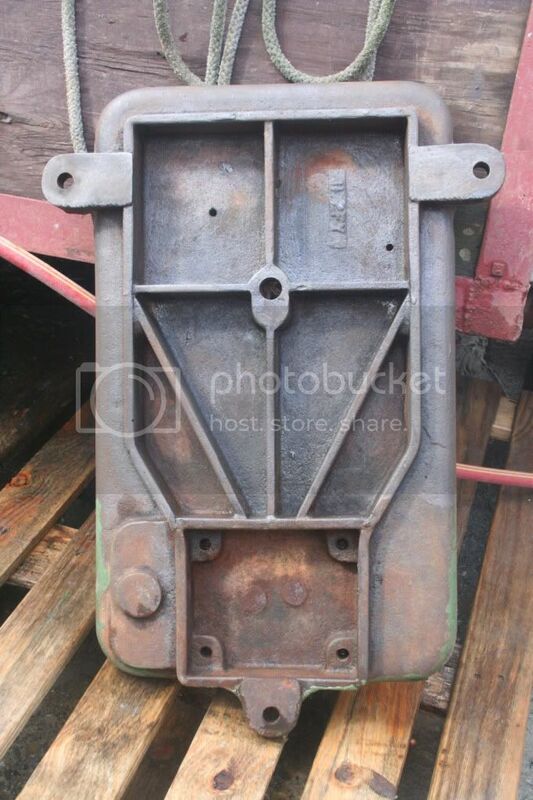 The largest parts I de-rusted were some 8x4 metal sheets I was using to fabricate floor plans for my Lotus 7 build. I found while it was excellent with tackling surface rust, anything in a poorer state was still a problem needing abrasive action needed to be taken first. In my very young days, I used to hang around with a budding archeaologist, and he had read about your process somewhere for cleaning artifacts. It might have been a different chemical used. So he set the experiment up on the table, and using some very dirty and encrusted roman coins (they abound around the area I live, very close to Watling Street), and he gave it a go. It worked fine, until he got too greedy, and decided to leave them in a bit longer than suggested, to clean out the heavily pitted stuff. Came back a few hours later, and all detail was missing off the coins, just blank discs. Now I think this might relate to you comment about removing paint. I don't think it actually attacks the paint, but removes a very thin layer of metal, so the paint flakes away because what it was bonded to, isn't there for it to bond to any more. Might be right, might be wrong, but maybe another slant on the process.